Teach To Stamp: Happy Birthday Noah! It was my nephew's first birthday party on the weekend! Of course I needed a fabulous card to mark the occasion. 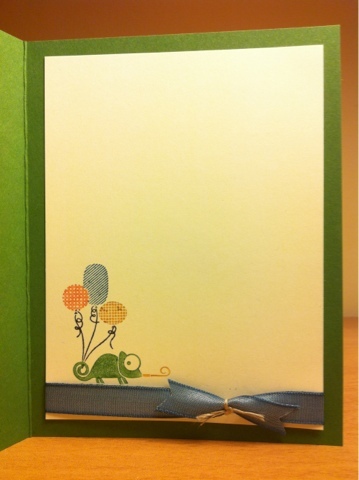 I loved a card from this post by Andrea Borries on snippetsbyandrea.blogspot.com, so I cased her basic design. I stepped it up just a little bit with some washi tape and the large splatter image from Gorgeous Grunge on the background. Those tiny confetti circles can move around, because they're in a vellum pocket. A piece of vellum, and a piece of Very Vanilla cardstock taped together with Witches Brew Designer Washi Tape. The adorable lizard image is from Tag It. A bonus with this adorable stamp set, is that when you purchase it Stampin' Up! donates $3 to the Ronald McDonald House Charities! I needed the inside to be cute too, so I stamped the party lizard again and added a little ribbon to cover up an ink smudge under his feet. 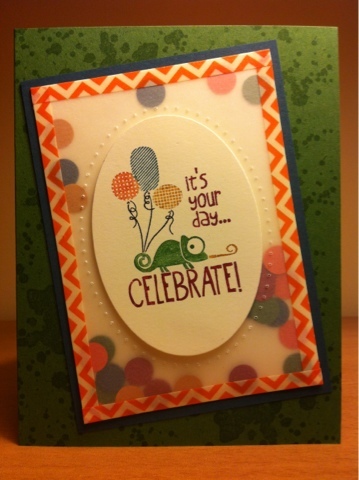 As I'm always telling the girls at stamp club, there are no mistakes in stamping, only opportunities for embellishment!